Glaisdale, in the North Yorkshire moors had two Wesleyan chapels, Glaisdale End and Glaisdale Head. The latter contains a Roll of Honour, seen Glaisdale Roll which appears to be that for the whole settlement. 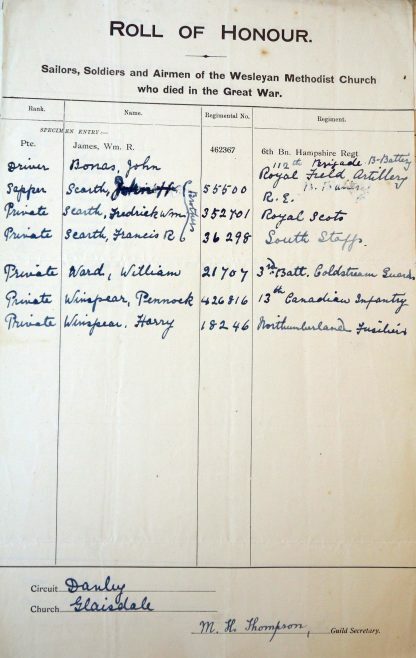 Private Francis R. Scarth 36298 South Staffordshire Regt. Both Winspears appear in the Commonwealth War Graves Commission records as Harry, but both rolls of honour are agreed that Pennock did die. They were brothers, as were the three Scarths.